Explore Downtown San Francisco, the Golden Bridge & Sausalito, Golden Gate Park with unlimited hop-on hop-off use for 48 hours. This Hop-On Hop-Off Pass combines four diverse tours on one incredible value ticket! It gives you the opportunity to explore Downtown San Francisco, the Golden Bridge & Sausalito, Golden Gate Park with unlimited hop-on hop-off use for 48 hours. 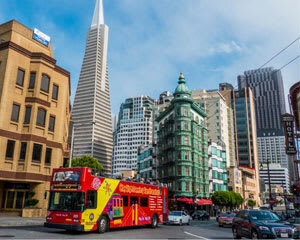 You can hop on and off the bus at any of the designated City sightseeing stops to explore the highlights and all major sights San Francisco on you own pace. In the evening, you can also enjoy the beautiful views of the city during the San Francisco Night Tour. Enjoy an entirely live narrated 60-minute tour of San Francisco's most famous attractions on an original open top Double Decker Bus in the Downtown area. Highlights include: Fisherman's Wharf, Barbary Coast, Financial District, South of Market, City Hall, Union Square, Chinatown, North Beach, Lombard Street and Pier 39. Departs daily 9AM-5PM every 15-30 minutes, year round. Depart daily 9AM-5PM every 30 minutes, year round. Depart daily 9:30AM-4:30PM every 30 minutes, year round. The live narrated 90 minute tour of San Francisco shows you the most vibrant neighborhoods of the city! With spectacular views fromt he top on an original open top Double Decker bus, the tour covers all major sites of San Francisco and visits the most popular areas, such as Fisherman's Wharf, Union Square, Financial District, the Embarcadero, Chinatown, North Beach and Nob Hill with its impressive Grace Cathedral. The tour includes two brief walking tours around Nob Hill and the Embarcadero for even more photo opportunities. Departs daily at 6PM (year round) and additionally at 7PM (May 15th-Oct 15th). 48 hour hop-on hop-off access for the Downtown Tour, the Official City Tour, Sausalito Tour and Night Tour. You must bring your Adrenaline confirmation to the reservation office located at 1331 Columbus Ave where you will receive your 48 hour bus ticket.